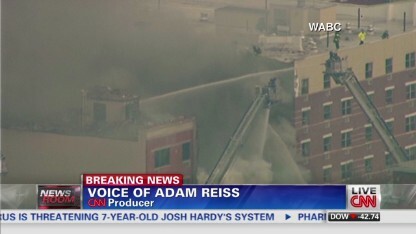 Breaking news from CNN on a deadly building collapse in Harlem, New York City. 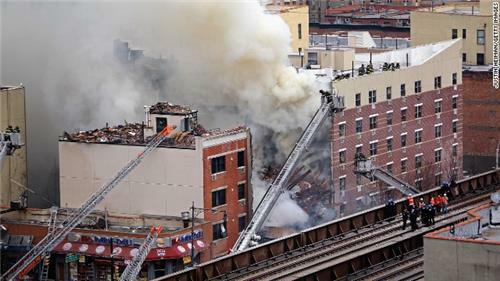 New York firefighters battle a fire after an explosion in the East Harlem neighborhood earlier today. 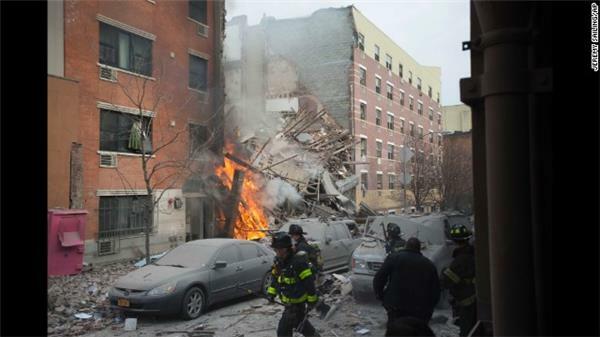 A powerful explosion shook Harlem in New York City on Wednesday morning, collapsing two buildings. 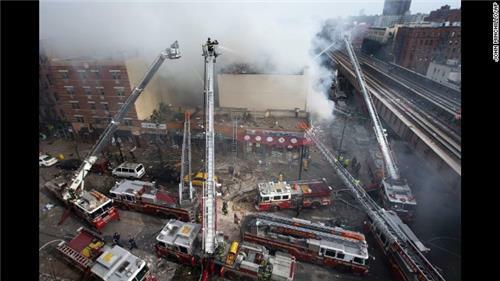 At least two people were killed and 22 more were hurt in the disaster at Park Avenue and East 116th Street, the New York Fire Department said. 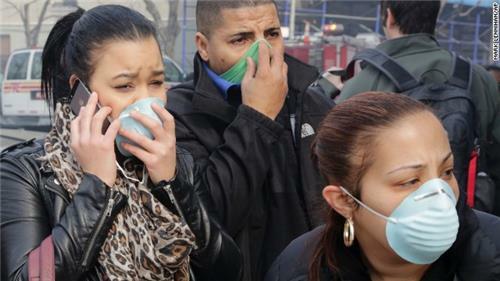 A gas leak was reported by neighbors before the blast – “the only indicator of danger,” New York City Mayor Bill de Blasio said. Follow the developing story on CNN TV, here on CNN.com and scroll through this blog to see how we reported the events as they happened. Two buildings with one adjoining wall affected. On the ground level of one building is a Spanish Christian church; the other has a piano repair shop on the ground floor. There are approximately 4-5 levels of apartments on top of those places. FDNY says it now has 138 firefighters on the scene. It's being treated as a five-alarm fire -- a major event. CNN's Poppy Harlow reports from the scene that's she seen two people being carried out on stretchers. Earlier, officials said that 11 people had been taken to the hospital for treatment. Law enforcement officials tell CNN they are not seeing any terror connection in the Manhattan explosion. The leading indication is that this was a gas explosion, the sources said. We're now told that 168 firefighters from 39 units are responding to the collapse. 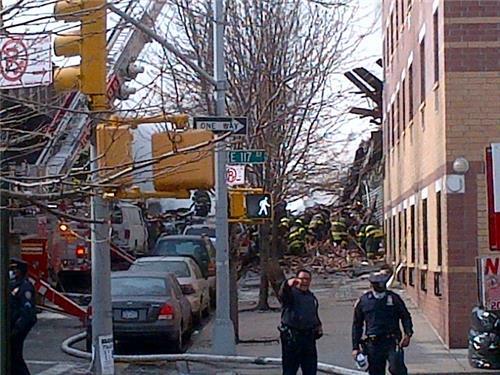 We've just heard from the NYPD that one man has been killed in the collapse. Neighbors tell investigators there was the smell of gas before the explosion, law enforcement sources tells CNN's Shimon Prokupecz. 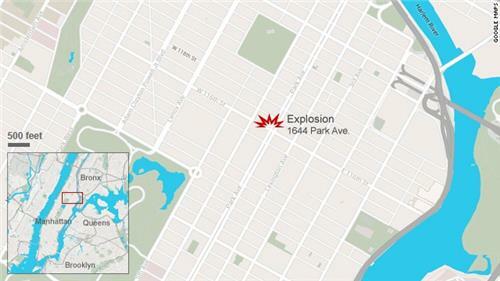 Here's a map from my colleague Sean O'Key that pinpoints where the explosion happened. It's in Harlem, north of Central Park. CNN producer Rose Arce sent this image showing the emergency response. "1644 Park Avenue appears not to be there anymore." 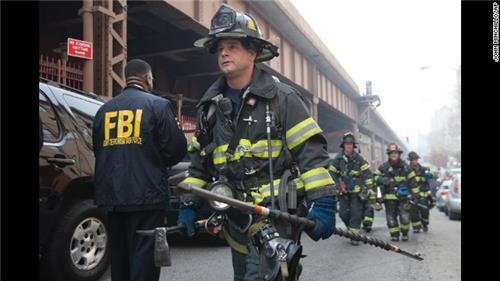 Firefighters respond to the fire on in Harlem. 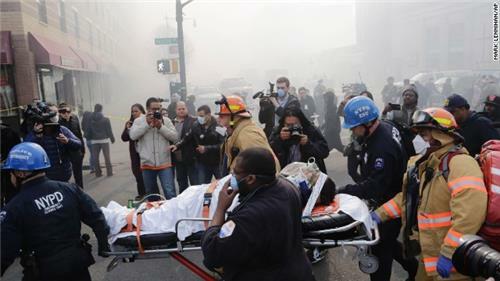 Rescue workers remove an injured person at the scene of the explosion. President Obama was briefed on the Harlem collapse by Lisa Monaco, Assistant to the President for Homeland Security and Counterterrorism, reports CNN White House producer Kevin Liptak. A White House official added: "The White House will to stay in close contact with the federal, state and local partners responding to this incident. "Our thoughts and prayers go out to everyone impacted by this incident and commend the first responders working tirelessly to save lives and contain the fire. Some 16 people have been injured, fire officials say in a tweet. 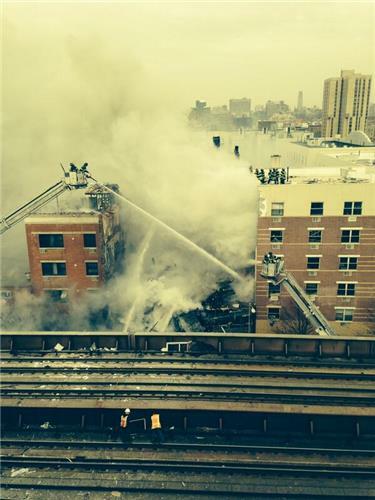 Now: There are 16 injuries related to the collapse at 1644 & 1646 Park Ave, #Manhattan . The scene is still developing. 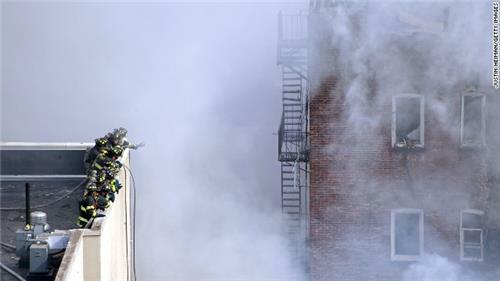 Shortly before this morning's blast, New York utility Con Edison received a call about a possible gas leak from an apartment building nearby, a Con Edison official told CNN. A utility truck was dispatched but the explosion happened before it arrived, the official said. CNN's John Berman says an odor was reported at 9:13 a.m. from 1652 Park Avenue, just a few doors from 1644 and 1646 Park Avenue. New York City Mayor Bill de Blasio is now at the scene of the disaster. We hear NYPD commissioner William Bratton is on his way as well. Con Edison, the local power company, is tweeting out what happened when. It says a call of a gas odor came in at 9:13 a.m. and a crew was sent out two minutes later. That crew got there just after the explosion at 9:40 a.m.
@ChrisWragge @CBSNewYork Call came in at 9:13, crew dispatched at 9:15, explosion occured around 9:40. #ConEdison crews are on the scene of a building explosion and collapse at 116th Street and Park Avenue in East Harlem. Report of a gas odor at 1652 Park came at 9:13 from a resident. 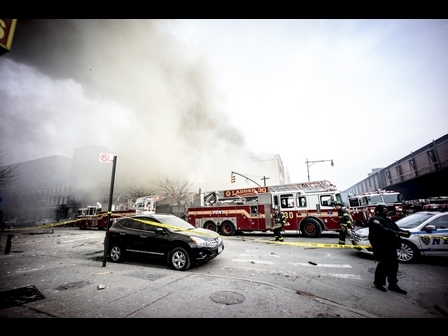 2 #ConEdison crews were dispatched at 9:15 and arrived just after explosion. #ConEdison crews are checking gas lines and working to make the area safe. We are working closely with the @FDNY . 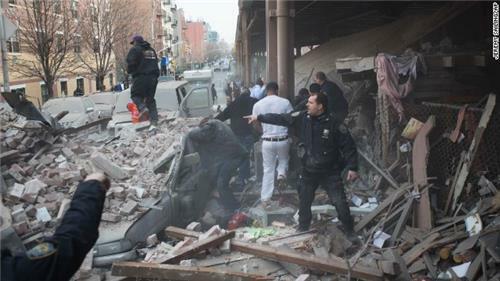 A second person has died as a result of the Harlem building collapse, a New York Police Department officer told CNN. Both of the dead are female, according to the officer. An earlier report said a man had been killed. The names of the women have not been released. There are now more than 250 firefighters working to tackle the blaze and search for victims. #FDNY Cmr Cassano: There are now 250 members at the scene with special equipment, currently extinguishing fire & doing search/rescue. Smoke billows from the site of the explosion and collapse. Hundreds of firefighters have responded to the scene. 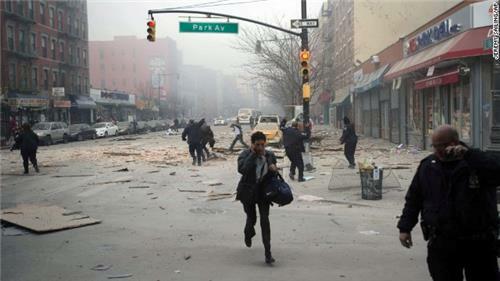 People run from the scene of the explosion. Firefighters work from the roof of a building next to the site of the explosion and collapse. Police search the debris in East Harlem. People watch as rescue efforts continue after the explosion. NYC Mayor Bill de Blasio does not want to give a number of missing out right now, as some of the people on the list may be safe somewhere else. But he pledged: "We are expending every effort to locate each and every loved one." New Yorkers can call 311 or tweet @nyc311 for information. And the Red Cross has set up a center with food and water for displaced residents at PS157, 176 East 115th Street between 3rd and Lexington.